Laos was the first country I visited after living nine months in Cambodia, so I was starting fresh again in a new country. I had to learn some basics of the language, how to get around, minimize being a scam victim and connect with local people. 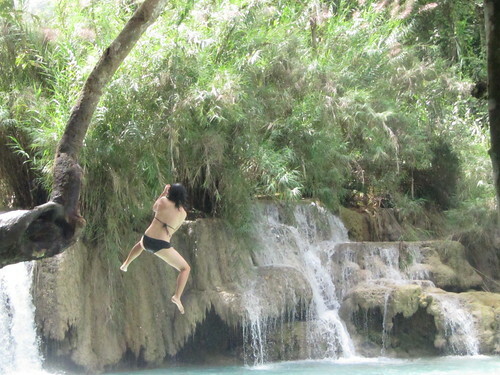 I spent the first two weeks in Luang Prabang then went up to Huay Xai in Norhern Laos for an overpriced ziplining tour, which pushed up my overall cost. 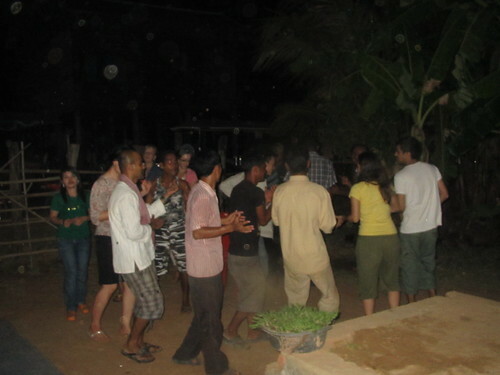 I was lucky to be introduced to local people in Luang Prabang to explore the city, dance and enjoy food together. All of these costs are in US dollars. 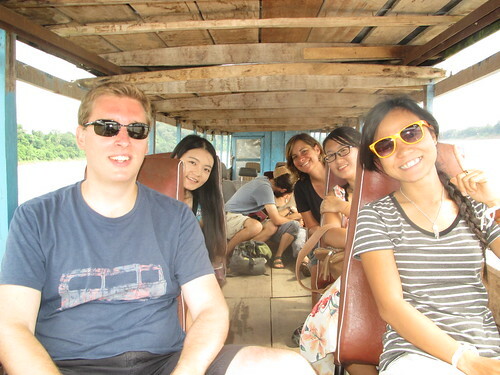 Small boat rides across the Mekong River: $0.50. On March 3, 2013, I left my friends, family and jobs to satisfy my curiosity and parts of Asia I’ve never set foot in. I’ve lived in Vancouver, Canada for the 26 of the 28 years I’ve been alive and I felt change was years overdue. While most people fear change, I have a much bigger fear of not having new experiences after awhile and feeling stagnate. I wanted to take a longer time to travel so my days wouldn’t be rushed and I could have more flexibility have more time to build relationships than simply passing through areas. While I’m very lucky and grateful to have had many unique adventures around North America with fantastic friends, I’ve had the best year of my life in Asia. I’ve been curious why my friends in Cambodia, Laos and Indonesia have all told me, “Don’t forget us.” I always respond by saying, “How could I ever forget you? !” I wonder if they’ve had people passing through in their lives that they lose touch with their traveling friends. I initially started this blog to share my experiences with friends and family, but it has evolved to be a living diary of memorable conversations and times I’ve had with the many wonderful people I’ve met. That’s why some of my posts are so long and probably have too much detail that won’t be interesting for some of you to read. My head and heart are often filled with new experiences in a short period of time and it is easy to bury the subtle moments and conversations I’ve had with people. So I write to so that I won’t forget. My great food-loving and outdoorsy friends in Vancouver, Canada. I was not expecting the number of going away meals that I had with friends, the university students I worked with, former colleagues and my family. I felt so loved and supported in my journey. 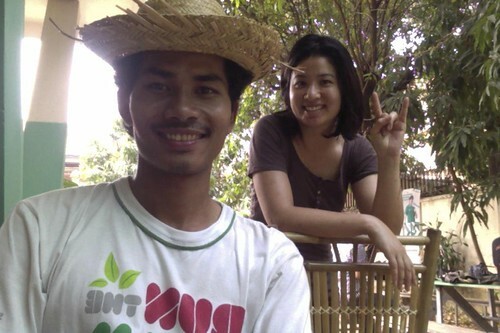 I last saw my friend Rithy Thul in 2010 when he led a cross-Cambodia fundraising bike ride. He is an entrepreneur, community-builder and cycling lover. Learning how to make pizza from scratch. The pizza this student made was better than most pizzas I’ve had in restaurants in Cambodia. Enjoying dinner in our friend Tin Tin’s hometown. 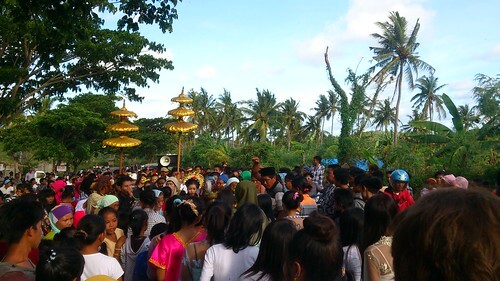 Cambodians celebrated Khmer (Cambodian) New Year from April 13-16. 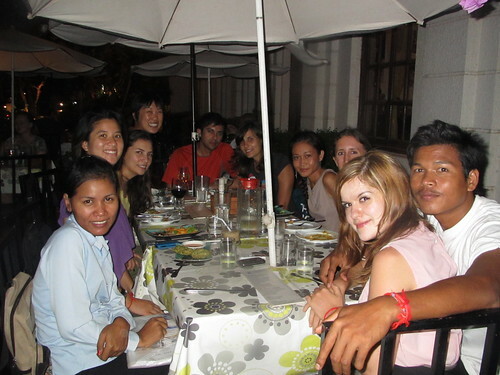 I was lucky to spend those days with my friends from Canada, Japan, and America along with Khmer people. One of my closest friends was so generous and flew from Vancouver, Canada to see me for 10 days in Cambodia and we were lucky she just happen to be here during this most festive time in the country. 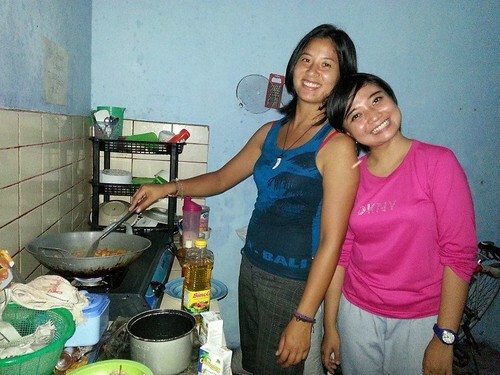 My friend and I also went to our Khmer friend Tin Tin’s family’s house for dinner about an hour away from Siem Reap. We ate a lovely meal and stayed to dance with his family and the kids in the community. Dancing in Tin Tin’s home town. Of all the festivities, one of the most beautiful memories was when my other friend and I took a tuk tuk late at night to see the Bayon Temple light up at 2:12 a.m. as part of the opening ceremony for Khmer New Year. There were no more than a few hundred Khmer people and we felt like we had the temple all to ourselves as we walked through. 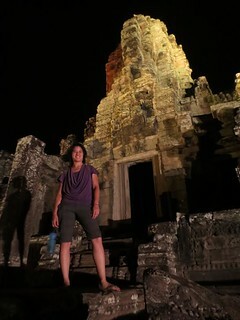 My friend and I at Bayon temple at 2:30 a.m. Taking a swim at Romdeng social enterprise restaurant. 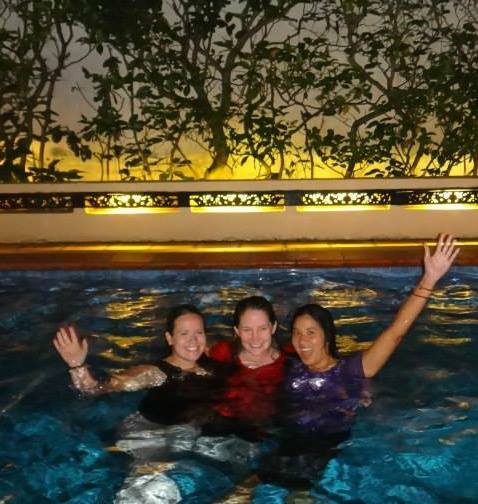 We’re swimming Khmer style with our clothes on. 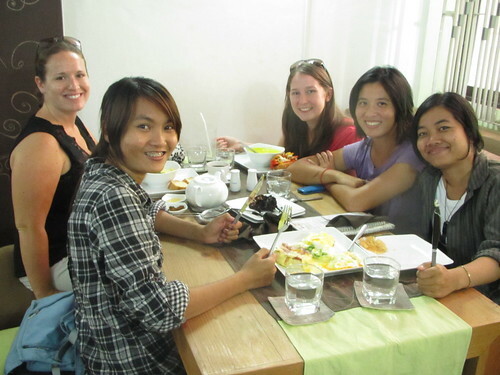 We enjoyed a delicious meal at the Daughters of Cambodia social enterprise cafe. My friends at Golden Temple Villa who rushed to get me some lovely gifts when they found out it was my birthday. They gave me a beautiful coffee mug, a bear and beautiful bracelets. My friend visiting from Canada and I lived at this lovely guesthouse for a week and we quickly became friends with the staff. After only knowing them for a week, I decided to have a birthday lunch at their restaurant and gave them just two hours notice. In those two hours, they rushed to get me small gifts with personalized notes. One of them even apologized for not having time to get me a small gift on time! This is only the second time I’ve celebrated my birthday outside of Canada since I was two years old. My biggest fear was being alone on my birthday and I was just happy to be with one or a few people over dinner. I didn’t tell anyone it was my birthday until someone found out because I didn’t want anyone to feel obligated to do something for me. But when people found out they showed up at the social enterprise Soria Moria to celebrate with me and it was a lovely evening. I appreciated new friends making time to be with me. 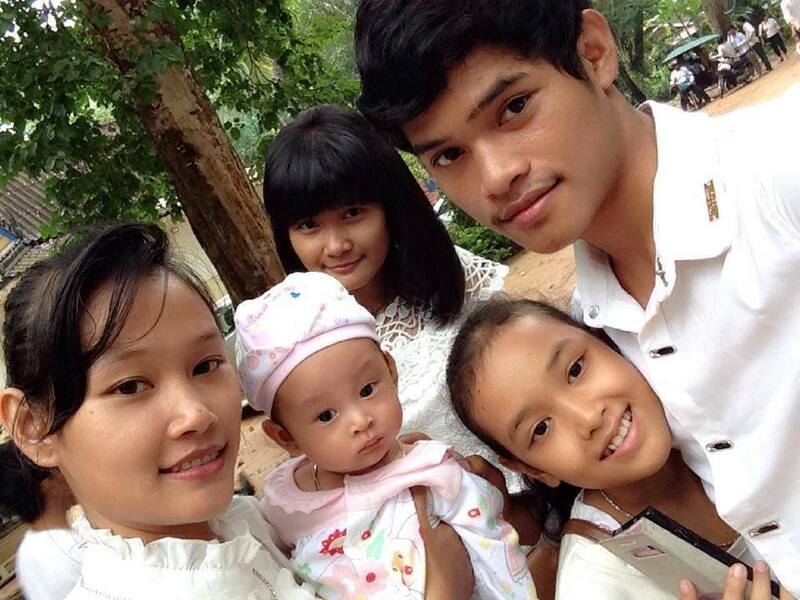 Picture of San’s family in the Kampong Cham province. I had a fantastic time spending Pchum Ben, a two-week religious Cambodian festival honouring ancestors, with three Cambodian families over five days. 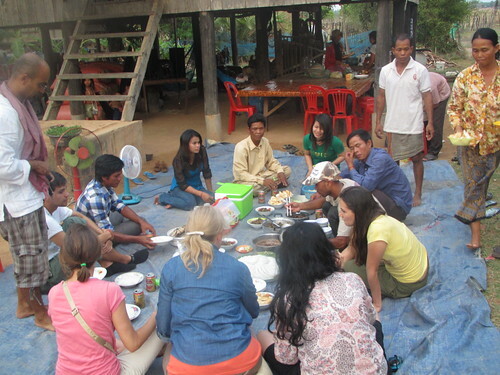 I first went to the Kampong Cham province to visit one friend’s family during flooding season. 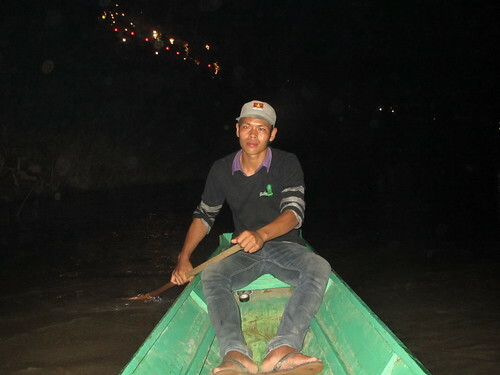 We took a five-hour bus ride, an hour and a half boat ride on the Mekong River, and a boat taxi in the flooded villages to get to my friend’s home. I participated in one pagoda ceremony with them, ate with them and laughed with the family. I love being the only foreigner when I visit places because I know it’s away from the places short-term tourists go. The wonderful girls who laughed at my pictures with me at the pagoda. 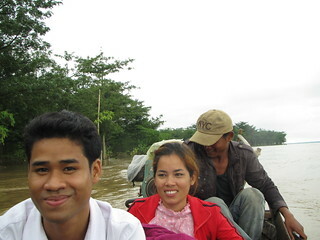 Taking the boat taxi to get to San’s home in the flooded village. I spent two days in Banteay Meanchey and my friends showed me around nice parts of their district, offered to pay for my meals and their family was happy to see me for a second time. My friend’s mom was so busy preparing for the celebration and helping with the daughter’s newborn son. But when they found out I was visiting, she spent a lot of time making my favourite dish Amok fish, which was incredibly sweet. My friend’s adorable and smart 6-year-old niece. She is at the top of her class in school and speaks quite a few words in English in the Banteay Meanchey province. 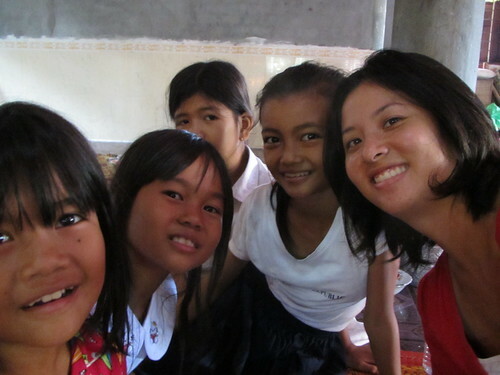 The wonderful girls who took me around Banteay Meanchey. These are the high school students who come to practice their English in my friend Seng’s village. He volunteers to teach them English every week. I was very happy to visit my friend Seng and his students in Sronal District, Siem Reap. He volunteers to teach high school students English several times a week and he said I could visit as a guest because they had never had a foreign visitor before. The students were shy at first but when they warmed up to me, some asked me a lot of questions and laughed at my bad Khmer. One student said, “I am very happy you came to my village. You can see my home next time.” I’m looking forward to seeing them again in March 2014. My Khmer family at Pchum Ben, a religious festival honouring their ancestors. How beautiful is this picture? I’ve spent a few months living at my friend’s apartment and have fully integrated with their family, whom I call my own now in Cambodia. My favourite times with them is when we eat together, catch up on the day and just laugh. I was a bad influence and introduced Dexter to my friend who would watch with me when she had time. 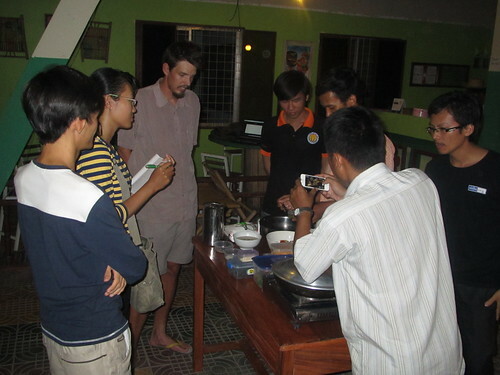 They often tell me, “We really want you to live in Cambodia, think of how you can start a business. You are never alone, you always have family in Cambodia.” **Tear** I’ve been to Cambodia for two rounds now and it’s hardest to leave them every time. Ploy (right), is the friend that I met semi-randomly who ended up hosting me so generously the whole weekend in Bangkok. Bangkok is one of those places where you can either have a really crappy time or an amazing time depending where you are and who you’re with. My only plan was to just pass through the city and I was getting so fed up with several things. But within the same day, I ended up meeting a new Thai friend named Ploy and friends from Siem Reap who just happened to in Bangkok for the same weekend. My completely unplanned weekend ended up being filled with a bike ride around the quieter part of Bangkok, the largest market I’ve ever been to, dancing and enjoying the unforgettable view at Banyan Tree Hotel, the second highest skybar in the world. 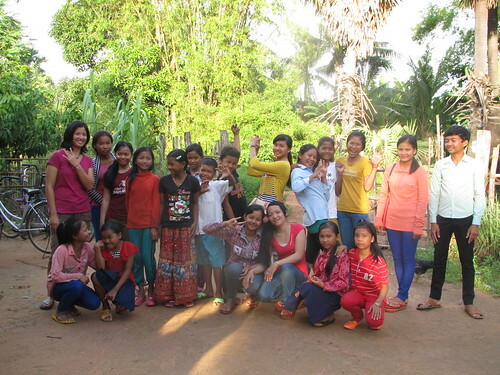 I was very happy to be invited by a friend to see her family in Ratanakiri, east of Cambodia for a few days. We saw my friend’s family farm that grew longbean, pumpkin and other foods, a beautiful lake, two waterfalls, drank Cambodian rice wine, went for karaoke and danced at a club. And we were the only 6 out of 10 people in the club. 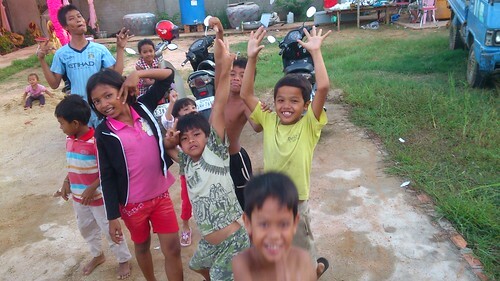 The beautiful kids who hung out with us when we took a break from riding our mottos. This is one of many recurring times that remind me that the best things happen when they are unplanned. My friend was great at not being so concerned about needing a map to get around and we should just drive around the island and stop whenever we felt like it. We met some of the friendliest people wherever we went, particularly the kids who came up to us to sit, talk and laugh with us in the middle of the farm fields. A traditional wedding ceremony was hosted at our guesthouse. 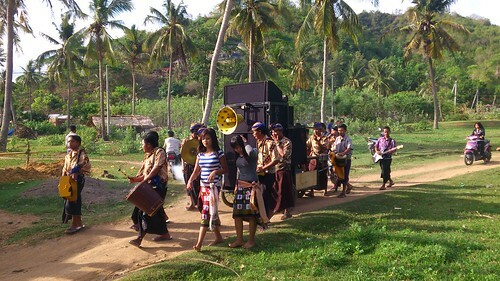 Hundreds of people accompanied the young couple from one part of the village and ended at our guesthouse. We stayed at Diyah Homestay guesthouse for a few nights and they apologized to all of their guests in advance for all the music and sounds because there was a wedding that was going to happen the next day. They were so kind and shared meals with all of us, invited us to the ceremony and also dressed us up in traditional clothing to be part of the celebration. We stood in line with many other people with a bowl of fruit baskets to offer the bride and groom. The awesome mobile wedding band. Thanks to our hosts, I was now properly dressed in traditional clothes and makeup for the ceremony. 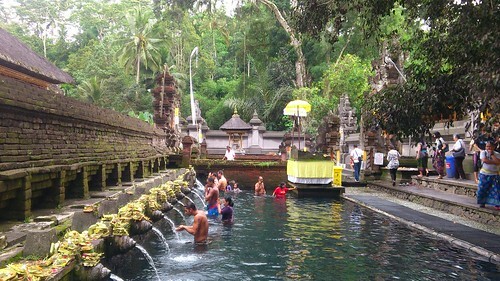 We visited the Tirta Empul Temple in central Bali. The spring feeds purification baths, pools and fish ponds that flow to the Tukad Pakerisan River. Various sites throughout the region and many other archaeological relics relate to local myths and legends. 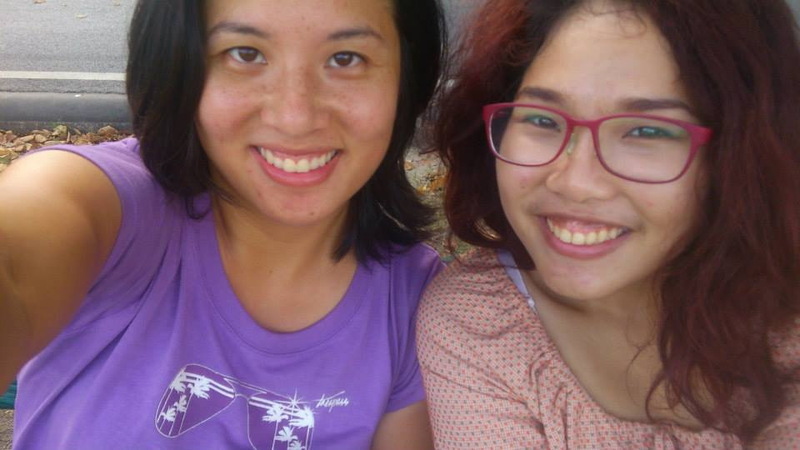 I met up with a friend who was living in Bali for a few months and we just met for two days in Siem Reap around August. I took her up on her invite to visit Bali and thanks to her, we saw an endless stream of beautiful landscape, rice patties, temples, traditional dance performances, jungles and night life. On day 2 in Bali, we went river rafting in the jungle that included a lunch buffet ($25 US for everything), had dinner at a very local restaurant, went to a surfing fundraiser for an NGO, went to a place with beautiful Latin dancers that involved basic lessons, a gay club with awesome ladyboys and one more club before having dinner number 2 at 7-11, which was instant noodles. And yes, this was all in one day. 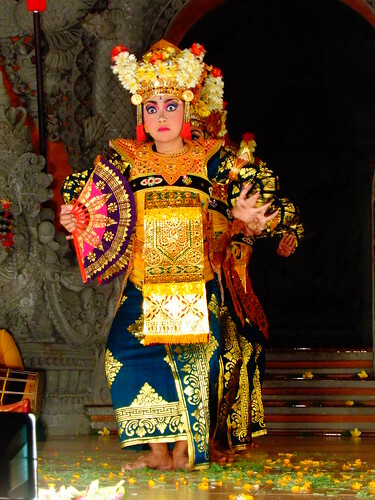 One of the seven traditional dance performances we saw in Ubud, Bali. Indonesia’s varied dance styles are made up of beautiful colours, stories and complex rhythms. I’ve never seen a dance like the ones we saw in Ubud. Attempting to make curry at Lalha’s home where I stayed for one night. 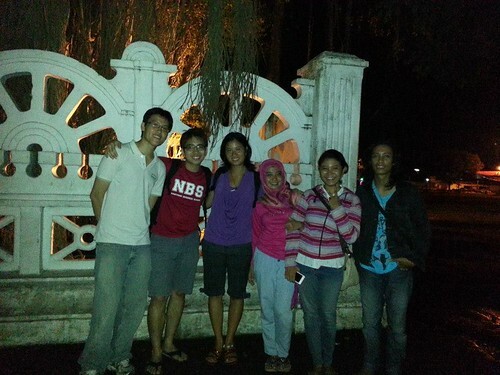 I met some fantastic university students through couchsurfing.org and were incredible hosts for the few days I was in Yogyakarta. The first night a group of us hung out, I jokingly requested that Ayumita, a wonderful 19-year-old student who sings at hotels weekly, sing a song just for us. So without hesitation, she went up to the live band and sang Rolling in the Deep for us by Adele. We spent our last hours together at the town square to make our wishes and rode an LED-covered bicycle playing club music. 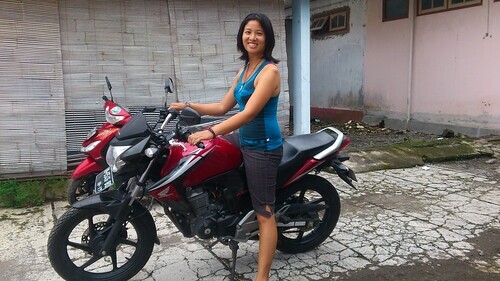 The next day, I took a motorcycle ride with one of the friends to the famous Borobudur Temples, we cooked curry together at Lalha’s house, went to a local coffee place with great live music, went to the wishing tree at a local park and took a bicycle for a few laps that was lit up and played club music. I regret not staying longer in Yogyakarta with these wonderful new friends, and it’s my lesson that I should just chance it at the airport and not buy a ticket out of the country. Why take a two hour bus with a bunch of tourists when you can catch a ride on one of these with a local person who knows where they’re going? 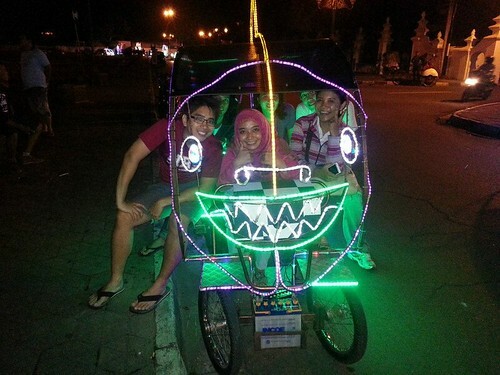 Why go to a club when you can listen to club music while taking a bike ride with friends in these creative works of art? 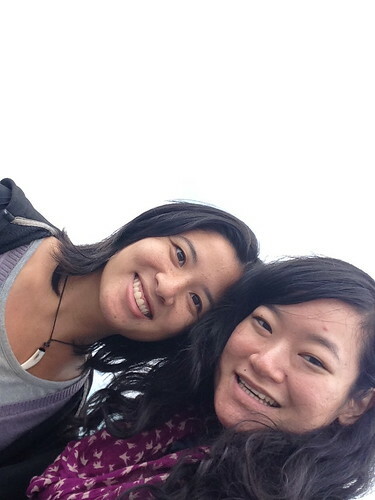 I stayed with one of my closest friends Susan for a week in Kaohsiung, Taiwan. The last time we saw each other was when she came to visit me in Cambodia in April. It was my turn to visit and we were very happy to reconnect. The only reason I came to Taiwan was to see one of my closest friends from Vancouver, who also came to visit me in Cambodia. I spent a week with Susan, which wasn’t long enough, but we saw some beautiful national parks and neighbouring island, drank the best milk tea I’ve ever had, and spent Christmas day with her classmates and mom eating take out food from a restaurant called Yaletown Bistro (a restaurant in Vancouver). 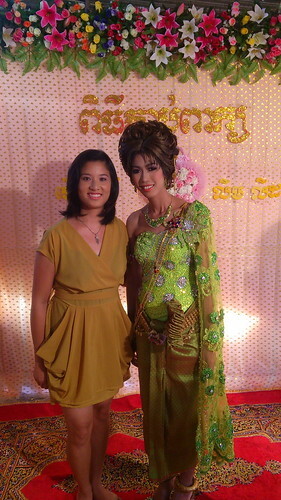 My friend Lida in her beautiful traditional Khmer dress for the first part of the ceremony. 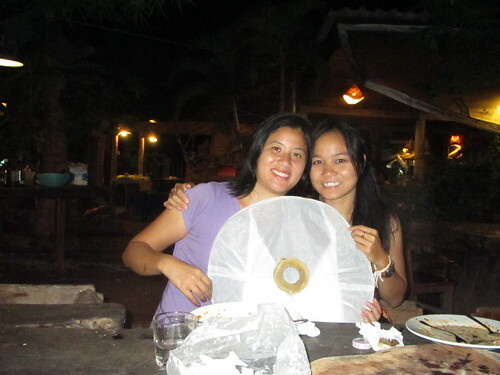 When I came back to Cambodia for a few weeks after Laos, my friend gave me one day notice to come to her engagement party. The next day I went with her by bus and motto to her family’s home for the weekend. I was happy to stay with her family and see everything that was involved with the preparations, including decorating their house, all the food that was cooked, the many colourful fruit baskets for offering and huge sound speakers for the day’s music. I enjoyed playing games and dancing with the kids in the village the most that weekend. Even when some of the kids didn’t speak English and my Khmer was very limited, they tried to converse and connect and I’m looking forward to seeing them again for the wedding in March 2014. My dancing buddies at the wedding. They totally made my weekend. 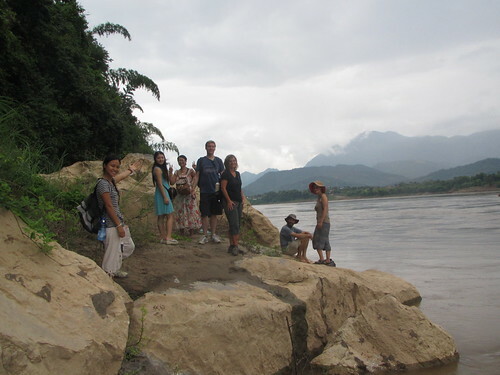 Our picnic spot by the Mekong River in Luang Prabang. 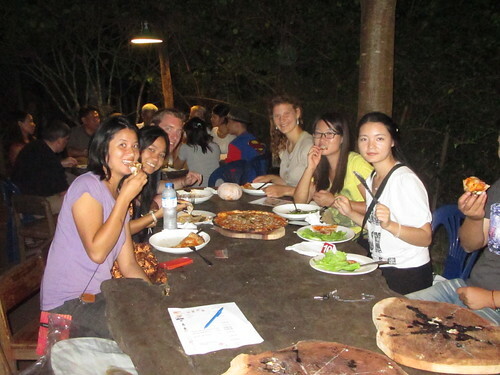 It was great hanging out with people who live in Luang Prabang and other foreign visitors. We went on small walks, had a picnic by the Mekong River, danced at a club with a dance floor filled with beer kegs used as tables, and went night bowling at the only place in town that opens past midnight. The extra lantern Tou brought for me so I could make a wish and send it to the sky. 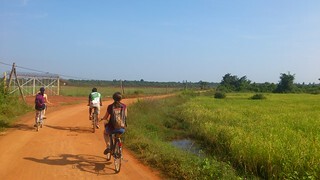 I always loved going with friends to bike around the villages and rice fields around Cambodia. I mostly did this in Siem Reap and the last ride I did in 2013 was with my great friend Cho who spent the day leading us around the Angkor Wat area. We stopped by for lunch at his cousin’s wedding in his village. I know 2014 will be filled with more new connections, unexpected events and more adventures. When we try to swim against the currents, we can only go so far until we realize that there is a path that’s already set out out for us. So it’s best to let go, ride the wave see where we end up. 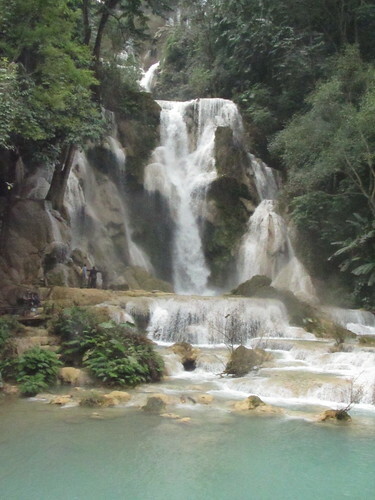 Kuang Si waterfalls is a popular sight among visitors who come to Luang Prabang. 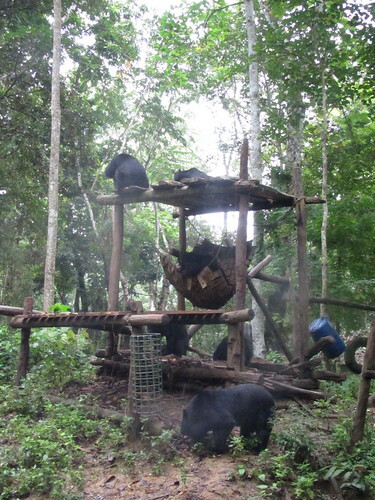 It is about 29 km from the city center and there is also a bear sanctuary on the walk to the falls. 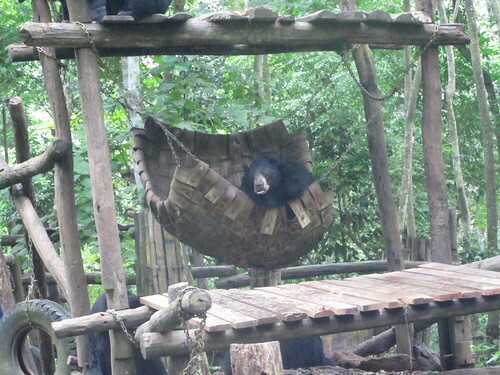 The bears are rescued from poachers who often hunt them for Chinese medicine. 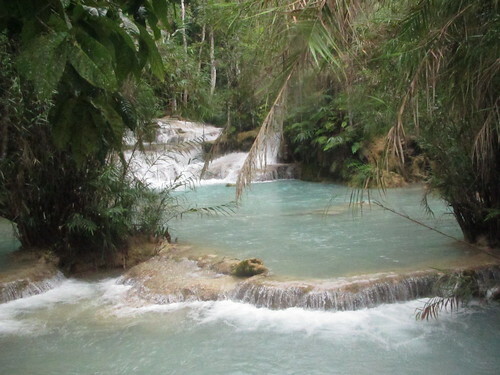 Kuang Si is the most beautiful waterfalls I’ve seen so far and its turquoise colour is gorgeous. If you cycle, there are some pretty steep hills on the way. From Luang Prabang’s city center, people can get to the falls by bicycle if you’re feeling fit or want to get fit, rent a motto for the day ($15 o $20) or hire a tuk tuk for about $20 and the entry fee is $2. Tip: many of the agencies around town have set departures at 11:30 a.m. and 1:30 p.m. Try and avoid going with these groups because the waterfalls are best in the morning when it’s quiet. One of my friends simply walked by Joma cafe or the agencies and asked people if they want to share a tuk tuk and was able to get enough people. So they each paid $2 each for both ways. You have two options to walk up towards the falls, but the trekking side on the right has leeches as my friend encountered. They took a wrong turn in the jungle and what should have been a 10-minute walk up ended up taking 2.5 hours! They ran into a man with a rifle who guided them back down the right way. You can stick to a guided path on the left side of the falls, but aside from getting some good exercise for 10 minutes, you actually can’t see the falls from the top. When you’re walking around forested area around Laos, keep checking for small leeches. Nothing to be afraid of, just pick them off as you go. I got a small bite, but didn’t get sick. And don’t forget to do the rope swing into the water! Don’t worry it’s deep enough, you’re not going to land on rock. Once you’re done with the falls, you can have a delicious meal a the small shops by the main entrance. While it may llook simple, the BBQ fish in Luang Prabang is always packed with flavour and better than most fish I’ve had in restaurants. It was on my adventure bucket list to do zip-lining and I heard decent things about The Gibbon Experience in Huay Xai in northern Laos. So I went up to do the three-day trip that combines trekking, zip-lining and sleeping in the jungle treehouse. 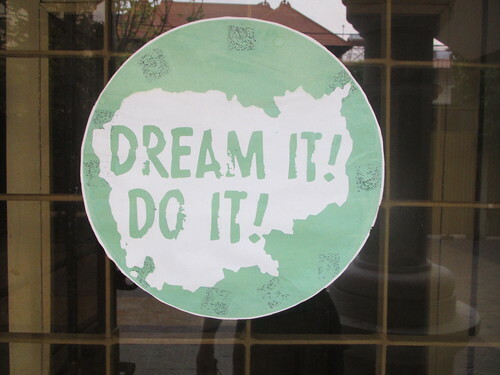 Yes, every child’s dream right? I have A LOT of recommendations that I will send to the company on how to improve the tour and make it more worthwhile for what people pay. But what upset me more was on our truck ride to the jungle, I didn’t notice right away that a mother was sitting with her few-month old baby and young son were sitting outside the truck with strong winds and rain coming soon while three of us foreigners were in the sheltered part of the truck. While the driver was getting gas, my friend and I asked him to ask the mother if she and her kids wanted to sit inside the truck in Laos. He just said, “No, it may rain, they are ok.” I didn’t believe him, so I turned to the mother and child and gestured, “Do you want to sit inside the truck?” And she immediately nodded her head and went to the back. What irritated me even more is on the two-hour drive to the jungle, the driver stopped by his village and we learned he himself has a wife with two kids and felt no sympathy for the mother and child in his car or to bother to ask if we can all squeeze in so they wouldn’t be exposed to the cold and rain. My friend also told me while he was seeing his family that the little boy in the car was smiling and playful until the driver yelled at them after the baby took a pee. To me, that’s just karma at it’s best. When I went to say hi to the mom and the boy, they looked so sad and the boy didn’t want to engage anymore. They looked traumatized from the way the driver spoke to them. Do tourists usually get priority over locals or was this another example of an aspect of Laos culture where women and their children are not as highly valued? Unfortunately, I’ve learned in many parts of Laos, in the name of tradition and culture, Laos women do not have as much power in decision-making, especially once they are married. Often once women marry, they stop their education. I was very sad to hear it is still common for children as young as 13 years old to get married. On an upside though, I have met a few strong women during my two weeks in Luang Prabang and Huay Xai who will be great role models for women of this generation. Change in cultural attitudes will come from within the communities as these women raise their children with the same openness and assertiveness they possess. 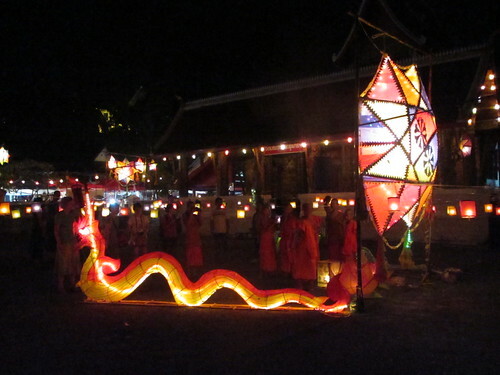 I came to Luang Prabang, Laos so I could participate in the Festival of Lights, or “Lai Heua Fai” on October 21. Every year, people around the country spend time crafting boats made of bamboo and banana trucks. 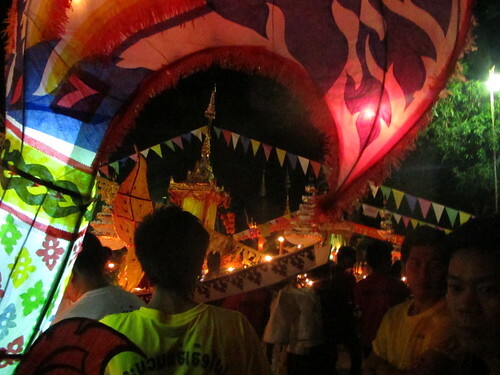 These crafts are given colour with flowers, candles and money to be sent down the Mekong River for good luck while people pay respect to the spirit waters. 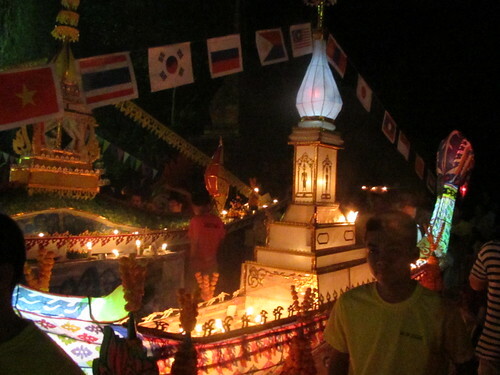 During the week leading up to the festival, we saw monks and people in different communities spending a lot of time decorating the pagodas or building their own boat to compete for the most beautiful one. I was grateful for a lesson in making the small crafts by the owner of the guesthouse I was staying at. She grew up Luang Prabang so she knew how to make every kind of design. 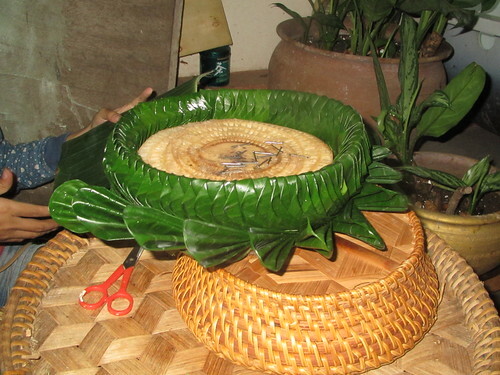 A beautiful design made with banana leaves by a Laos woman. I wish I was this crafty. It was amazing to watch this quiet city turn into a vibrant festival with music, fire, lights and dancing. Some of us went to the Mekong and sent our good wishes to the river along with the other 20,000 boats. I actually lost some of my friends along the way and even though I was in a crowd of thousands of people with music, dancing and this beautiful celebration, I felt very alone for a bit. I’ve learned I can’t enjoy even the must beautiful celebrations if I am alone. I’d rather be doing something simple with friends or family. 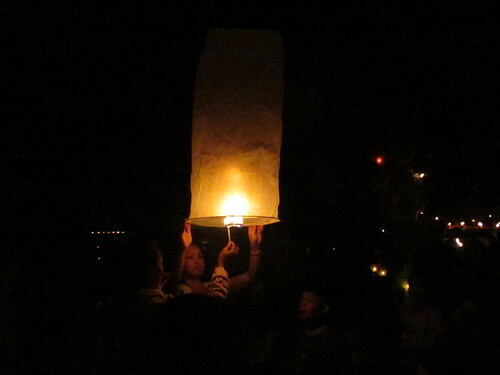 Nevertheless, I loved watching people lighting up lanterns that floated up into the sky. I couldn’t but think, “Why can’t we do these kinds of things in Vancouver?” There was a lantern festival for awhile but unfortunately funding went down and there have been less of these kinds of community events. 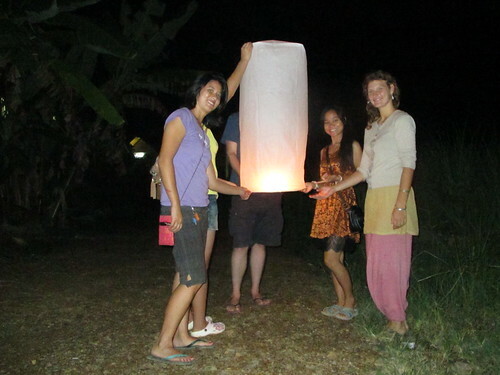 The sky lantern originated in China and were used strategically in wars. As years passed, they were included in festivities. It was an unforgettable experience and the days after the festival only got better as I spent more time with the people I’ve met in Luang Prabang. 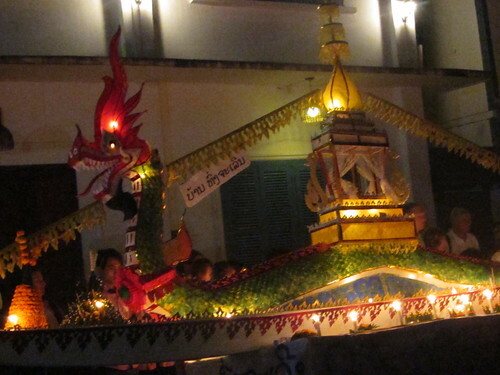 Parade of floats that were made by different communities. On the left is a lovely couple I met from the Netherlands, my friend Tou and another friend from Italy. 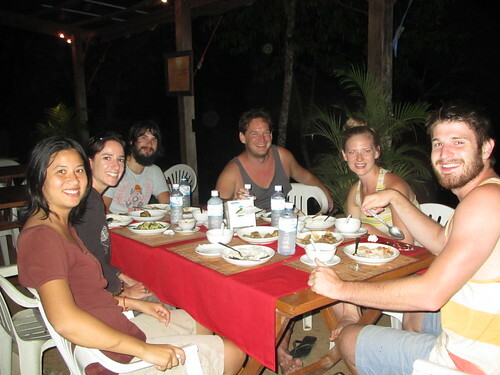 We’re enjoy the fantastic food at Dyen Sabai by the river. It’s a weird, and sometimes hard, transition for me to be living comfortably in Siem Reap to being a backpacker again. Ok, I admit, sometimes I’ve done the touristy things but unfortunately I have to switch my mentality and can’t completely avoid being a tourist sometimes; especially when I’m in a country for a month or less. It’s not going to be the same as Siem Reap where I’ve spent an unforgettable seven months building relationships with Khmer people and some expats (foreigners who live in Cambodia). My experience now reminds me a lot of when I was backpacking in Europe and meeting other travelers who are looking to explore together. I forgot how easy it was to meet people as you go along and plan day or multi-day trips. 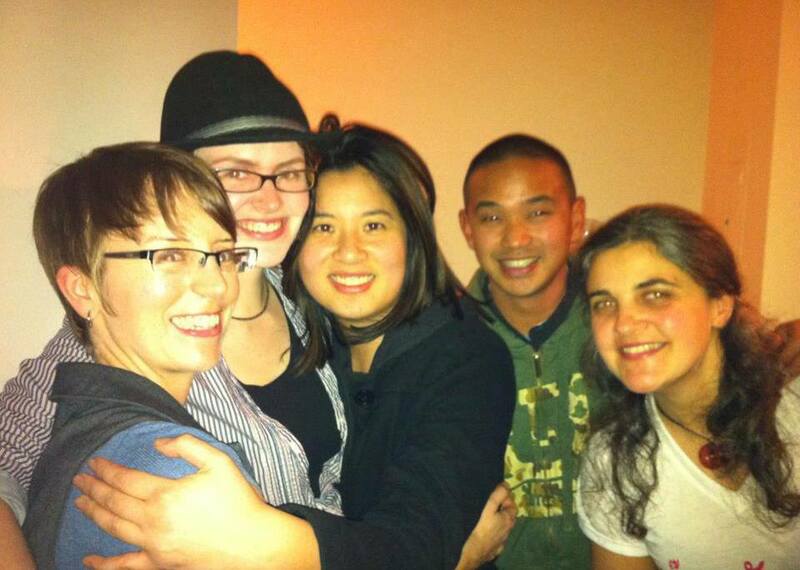 Friends from Italy, China, Laos and a fellow Canadian! I’ve met some of the most interesting and diverse people the past year. It’s really refreshing to meet other people who have also quit their jobs to travel where they please or found jobs in Asia because it’s where they want to be. We don’t have to justify what we’re doing to each other. Rather, we simply share stories and understand each other. For some of our families, taking a long time to explore the world is really unthinkable. We’re often pressured to take life’s “normal” course and get your degree, get a job, get a mortgage and settle. Many of our circles of friends are buying places, having babies, getting married and settling into the same place. There is absolutely nothing wrong with that lifestyle, it’s just not the place some of us want to be at this time in our lives. 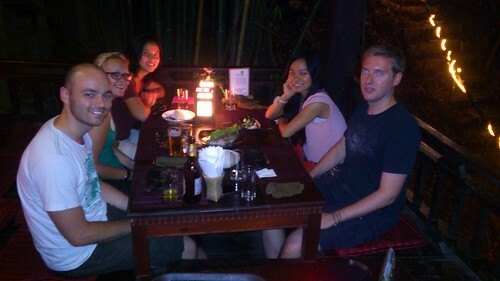 After eight months of being in Asia, I finally met a few people from Vancouver at Elephant’s Village in Luang Prabang. I also met a woman from UK and their friend from Australia during the tour. A Hungarian couple on a two-year honeymoon trip bicycling around the world. They had never left Hungary before this trip and by the time I met them during my first week in Cambodia, they had cycled through Europe and the Middle East. 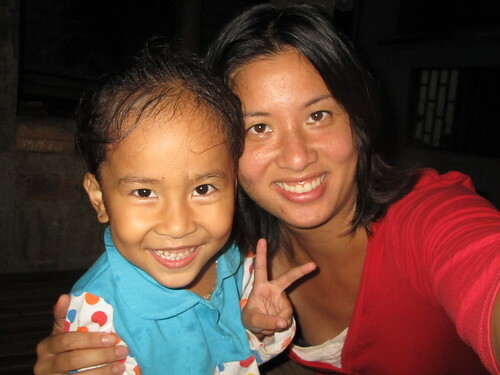 A Canadian mother of three who was sent to Hanoi, Vientam to do training for staff in the maternity department. She worked in Uganda many years ago for three years while her now husband was in Zimbabwe. She has taken six months to work in Vietnam and travel. A woman from the UK who works for a renewable energy company in Bangkok. She’s worked there for two years now and is returning in the UK for a bit but finding it very hard to leave Asia and the wonderful life she built for herself in Bangkok. My mistake when I was backpacking in Europe in 2008 was pre-booking everything. It was my first time traveling alone and I wanted to make sure I had a place to sleep every night. But now, the benefits of long term travel is I can keep my schedule open and if I find a nice group to do some outdoor activities with and just go. So far, everyone I’ve met and done day trips with have been very laid back. Even though we only see or know each other for a few days or less, we share unique experiences and have new people in our global network. Sometimes it feels like a mutual friend fling, but it works and that becomes the norm when you’re doing a global trek. This was my second dinner in Luang Prabang and my friend asked if I wanted to take the boat to cross the Mekong River to get to Dyen Sabai restaurant. Beautiful night, a free boat ride provided by the restaurant, yummy food and good company . . . of course I’m in! 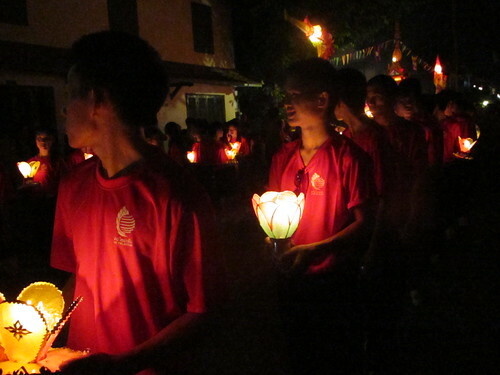 The night was so beautiful and I couldn’t believe that people could do this every day if they lived in Luang Prabang. 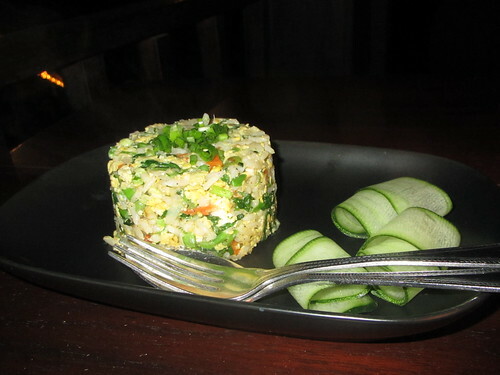 The restaurant atmosphere was calm and there was a good variety of food and drinks on the menu. 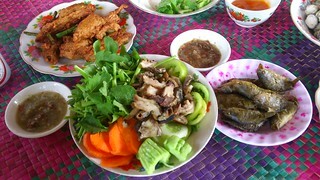 My friend and I shared the steamed fish in a banana leaf. I’ve had a lot of fish in my life and I can honestly say this was one of the best tasting fish I have ever had. Most steamed fish I’ve had in the past has been bland. 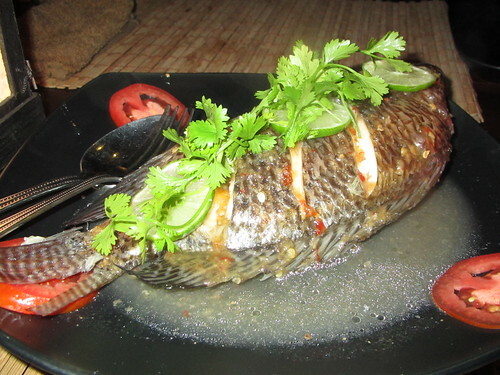 The fish had so much flavour that lingered in your mouth long after our meal was done, it was incredible. People in this city really know how to do flavours well. If people are in Luang Prabang, this is definitely a restaurant to check out.